Hi, my name is Russ Wigh. I did a wintering hummingbird survey last year, ably assisted by Mary Landers and the Savannah Morning News. This year I would like to repeat the survey with some structure and rigor thrown in. So why am I doing this? 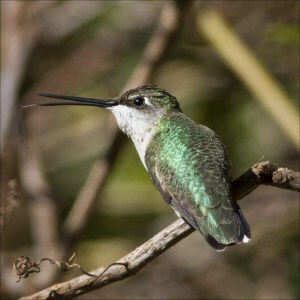 Researchers at Cornell and elsewhere have yet to take into account the regular movement of wintering hummingbirds along the coasts of Georgia and South Carolina and I would like to change that. If you would like to participate in this survey and live along the coast of either Georgia or South Carolina, please contact me to be added to my email list. Species identification is important of course, so I am including information for making a comparison between four different species we might expect. On the other hand, if a bird shows up at your feeder which does not meet these criteria, let me know, and we will try to get someone out to photograph it. Use plain water boiled until the cane sugar is dissolved (four parts water to one part sugar). This is all you need, not the red stuff sold in stores. Store extra sugar water in your refrigerator. Change the feeder at least every week during the winter to keep it fresh. hosted by Audubon and Cornell, you will be doing researchers, and me, a big favor. Here is a field mark I neglected as a way of separating Ruby-throat from Black-chinned. 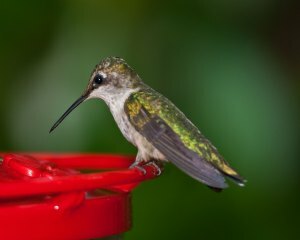 When a bird is sitting at your feeder with its back turned toward you, note in the attached images that the tail extends beyond the wing tips in the Ruby-throat. Fitz Clarke’s shot of a Black-Chinned shows that there is no extension in this species.